The ASN (Advanced Shipment Notice) has an aura around it of being this most complicated of transactions, that causes retail suppliers to cringe. In reality the ASN is actually a very intelligent transaction and if one has access to the correct data, is actually not that difficult to generate with a good translator. I have heard so many companies complain that they have issues with their ASNs that it has become de rigueur a transaction that is viewed with some fear. I find that incredible. The reality when you start to peel the onion is that there are a number of issues that come to light. I am not going to discuss the data issues, as I have covered those in earlier blog articles, but rather I will look at the labelling side of things. Labelling or in the jargon of the supply chain world, the UCC/GS1-128 label or in Canada the MH-10 label seems to cause lots of problems so I figured I would spend some time examining the label. Why is the label important? Very simply it is an integral part of the supply chain linking the contents on the pallet or in the carton to a serial number that in turn is returned to the receiver in the ASN or 856 transaction. The serial number is important because it is unique and is scanned to reconcile against the inbound ASN data. So getting the wrong label on the wrong box, or having a label that cannot decode has become a capital offence. An offence that, in most cases, generates a charge back or compliance charge. I am not going to delve into the label layout as it varies from retailer to retailer and has essentially the same information across the board. What I want to concentrate on is the quality of those labels as it is an often overlooked element and one that is important. We are rarely asked about label quality but when we bring it up people are surprised. 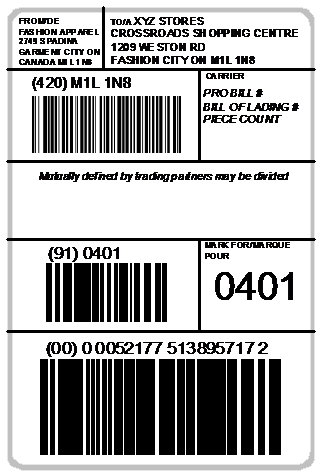 The quality issue is a single one – can I decode the barcodes that are on the UCC-128 label. The cause however of not being able to decode is twofold. How the labels are printed is a big issue. Many smaller companies happily print labels on a laser printer or an ink jet. We do not recommend either. The cost of the consumables on a laser are usually twice to three times those of a thermal printer and an ink jet is well shear madness. Get the label wet or rub against the label and bingo you just won the compliance charge lottery! We recommend to all our customers a thermal printer. The reason is very simple. Consumables are inexpensive, printer speed is amazing and we rarely see labels that do not decode. Do you have problems with your ASNs and your labels. If you do we have the solutions. EDI Desktop is a full featured pick and pack system for ASN compliance. Click on the link below for more information on this easy to use and flexible product.